Hello everyone and welcome to the A Blog Named Hero 5th anniversary blog hop! I’m so glad to be in the line up! Happy Birthday ABNH! Thanks so much to Linda Trace for having me as a special guest in 2015 and thanks to Jessica Frost-Ballas and Lisa Stein for inviting me to the celebration! This hop will take place over TWO DAYS (this is day 2) and there are different giveaway prizes to be won EACH DAY!!!! 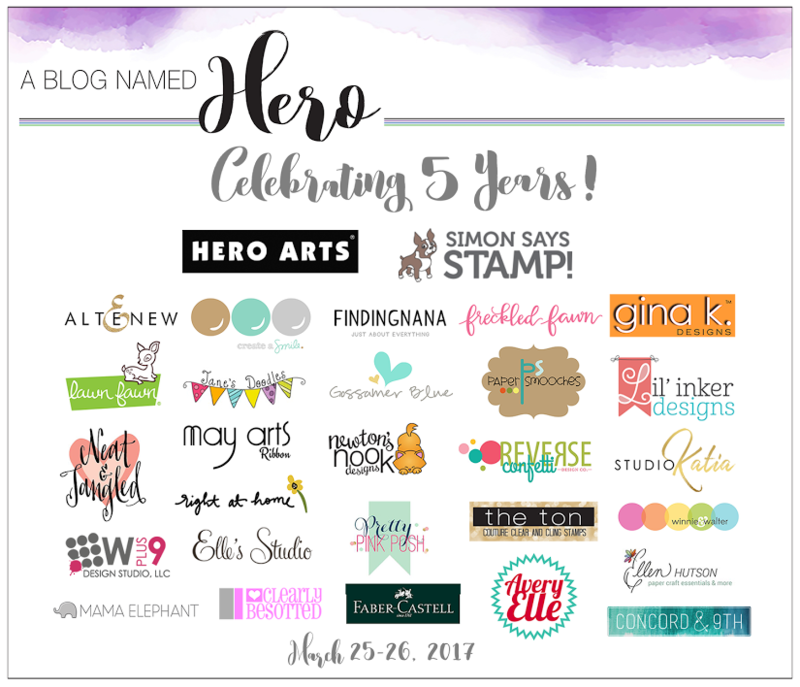 You’ll find the giveaway details are at the bottom of this post but make sure you hop around to all of the blogs to see lots of amazing creations using Hero Arts products! I first colored and fussy cut the two cute bears. I made the same with the hat. The hat is from the Party and Cheers December 2016 monthly kit. Next, I sponged blue inks over a top-folded white card base using the Scales stencil. The "Happy Birthday" sentiment is from the It’s your Day sentiment set and the "let’s party!" is from the Party and Cheers kit. To finish off the card, I rounded the bottom corners, adhered the image with foam pads to the background, added Stickles to the hat and glued tiny stars around the adorable bears. From the left to the right (unfortunately, some items are retired): Owh Lil Hoot, Feathers, Plumeria Collection - Pattern Hearts and Flower (by BasicGrey), Flower Dot Pattern Background, Zig Zag Pattern Stencil, Palm Fancy Die, Clouds Background, Tiny Flags Background, Silly Scape and Prayers. Now I wonder, what are your favorite Hero Arts products? A Blog Named Hero is so thankful for our wonderful sponsors and collaborating companies! Several companies decided to help us celebrate our fifth anniversary with giveaways and they were so generous that we decided to spread the love over both hop days with different prizes to be won each day! Giveaway prizes total more than $500! To win, leave a comment on each hop stop. We will select winners randomly from different blogs so the more blogs you visit each day, the greater your chances of winning! And be sure to visit the Saturday post from A Blog Named Hero for the list of Saturday hoppers and prizes! Comments must be left before 11:59 PM EDT on Tuesday, March 28th and winners will be announced on March 30th. Your next stop is the fabulous Kathy Racoosin! If you get lost anywhere along the way or encounter any broken links, you can find a list of all the hop participants on the ABNH blog! Good luck and happy hopping!! Francine, this is absolutely darling! The perfect card - I'm pinning this for inspiration - my grandkids would adore this! You always have the sweetest cards and beautiful blended colors!! Such a cute card today!! Your card is ADORABLE Francine! So sweet! Fun seeing your top 10 favs too! I need acaordvlike this for my great nieces! Such a cute card! Your coloring is awesome! The card is charming and I just want to be part of their hug! Such a sweet card. Love the bears. This is so adorable!! The coloring is STUNNING!! I love to see what other peoples favorite stamp sets from companies are. Thanks for the inclusion!! Beautiful coloring and great image. awww, look at their sweet, sweet faces - so adorable! 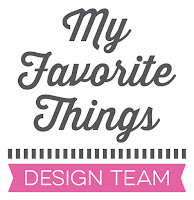 what a darling card Francine - and so fun to see your favorite HA products! Happy 5th Anniversary! Thanks for the blog hop. What a fun card! This is pure cuteness! I love you you added the soft stenciling in the background! Thanks for the inspiration! OH MY GOSH! SO CUTE! Love this image -One of my favorites from HeroArts. Love the whole set! Your card is so adorable! I love your coloring and the soft stenciled background! Cute card. Great shading. Thanks for sharing and a chance to win the give away. Adorable card! I like how you sponged the background, It really sets off the cute bears. Love the subtle background for this card, it fits the card design so well! Your card was over the top cute! Love those "eyes". The coloring is wonderful! Thank you for sharing! Such a cute card and I love your coloring on those little bears. Those bears are too cute!! Love this! What a fun card! Well done! Very sweet card. I love the bears looking at each other! Your card is so cute. A great design to celebrate the anniversary. Thanks for sharing it. Cute as a button! Thanks for sharing. Sweet card. Thanks for sharing. What a fun card, Francine! Thank you! So cute and clean! Love it! OMGosh this is so super cute! I love it. This card is sooo adorable! Love it! Really like the soft background too! Loving this blog hop with all this talent and inspiration! Thanks for sharing yours! So cute and cheery, love this for young children!! Awww such a cute card! What a super CUTE & FUN card! Your coloring has such depth! So Much fine. Great coloring. Your card is sooooo adorable! ! Love your card and thanks for sharing your top ten Hero Arts. Got me to thinking what my top ten is. 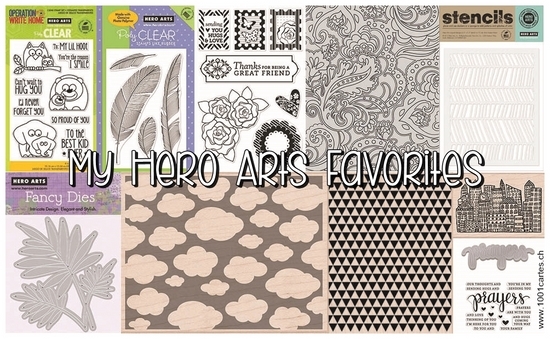 I think all my Hero Arts Kits would be there as well as some background stamps. Oh my goodness. Who would not love to get a card like this? The coloring is fantastic. Such a cute and fun card! Absolutely adorable! Love the coloring and colors. I love blog hops because they are so inspiring--thank you!!! Love your top ten! Great card. This is a great card, quite a standout from the others showcased on the blog. I like the coloring for the bear, really awesome job! Such a sweet card! I love the soft background! Such a cute card to help celebrate! Your card is absolutely delightful, Francine! I adore the bear in the party hat, too cute! What a cute and happy card, I love it !! Thank you for sharing your talent ! Oh my goodness, this is so sweet, I love it! Great colouring and a lovely design altogether! Thanks so much for sharing and inspiring! Oh my, your card is adorable! Love that bear! So stinkin' cute. Really live it. This is a cuddly card full of love and sweetness. It begs for a hug. Love the way this card makes me smile. Perfect for a very happy birthday! I have such a thing for bears 😃 ! Happiness always on your 5 year anniversary to a blog called hero ! Very adorable card with great coloring. LOVE this card. It kind of looks like the bears are nestled in an igloo with the way the stencil sits around them. Amazing coloring job, too. TFS! Such a cute card, going to make someone smile. Adorable card and I love the stenciled background! How cute! Outstanding coloring, too! Such a fun and cute card, love it. Such a cute children's card. Love doing playful cards. Such a cute card . Great coloring job! Your card is adorable. Thanks for the inspiration and participation in this blog. What a cute fun card. I like to mix up my styles too. Adorable card. Thanks for the inspiration and participation in this blog. Like the coloring on the bears. Especially like the party hat. I have this stamp & need to use it more. Fabulous coloring, and this is an amazing card. One of my favorites from the entire 2 day hop. Some of my first stamps were from Hero Arts and they date back too far for me to admit. But the sentiment stamps are still going strong. Thanks for the inspiration and a great chance to win. Love these guys! And your background is perfect! Great card! Such a sweet card! I love it! Thanks for the inspiration! Your card is so cute, great for kids or adults! Love that subtle stencilled background. Love the eyes and the background - this hop has been so unbelievable the cards have just been outstanding on this blog hop. Congratulations to the ladies on their 5 years. What a sweet card Francine. Love the cute image... amazing coloring and stenciling in the background. Such a sweet card, reminds me of me and my grandson. Those bears are precious. Great card. This is an "AWE" card, if ever I saw one! Cute card. The eyes make it. This is such a sweet image! I love the soft inking from the stencil and the amazing coloring! Such a cute and happy card! Adorable card! Love these bears so cute and the coloring is gorgeous! Very nice card! Thanks for sharing! This card is so cute and love the little one. Thanks for sharing. So cute and fun birthday card. That delicate blue background makes those bears pop right off the page. So cute! Thank you for sharing this sweet card! Adorable card, thanks for sharing!! So cute! Love your coloring. I love this stamp set so much, you made a beautiful card with it! Awww Francine, this is adorable! Fabulous colouring! beautiful coloring on this card!! thanks for sharing. So stinking adorable! Great card! Adorable card! Love the stenciling and coloring. Aww. So cute. Great CAS card. This is so adorable. Great coloring and design. The look on those bears faces is priceless. I love this card-super coloring and blending on the bears! Your card is so cute! I love how you have colored it. Thanks so much for sharing with us. Adorable card!Thank you for sharing. Happy 5th Anniversary to ABNH! Adorable card - love your design and the colors you used. We appreciate you helping us celebrate at A Blog Named Hero! Such a cute card! I love the Hero Arts products! I love the soft, pretty background you made for your cute bears. I liked seeing your top ten favorite HA products. I do wish some were not discontinued. TFS. Such a lovely card. Thank you for the great ideas! I had to smile when I saw this card. Thanks for sharing a darling card. Adorable card! I like the effect of the scales stenciling for the background. This cute card just makes you want to party! Francine, such a sweet card. Love the extra detail of the soft stenciling in the background. This card is adorable. Thanks for sharing. As always your coloring is masterful but using that background makes your bears fairly jump right off your card. Awww, what a darling card! 😍 love it! your bear card is so adorable! So sweet! Love the fade. What a cute card! Love the colors and how you colored the image. Thank you for the chance to win! This card is so cute! And its bears!!!! Darling card! So cute for a birthday! Great job! OMG!! That card is so stinking adorable!! Such a perfect design with the softly inked background behind it!! I have this stamp set & hadn't used it yet...I hope it's okay if I totally case your card...I love it!! your card is simply adorable! What a fun and happy card! Lovely card, Francine! Your design is over toe top and your coloring is fantastic. So cute!! What amazing coloring skills and I love the faded out background. This is so adorable! Love it! Thanks for sharing! Shading is great-- looks real! Your cars is so sweet, l would have a hard time choosing my favorite too. I have this set and your coloring is amazing!! Thanks for the inspiration! I need the other set to add the hat!! Super cute card! My favorite HA product is the Prayers stamp and die set. I use it all the time. TFS! 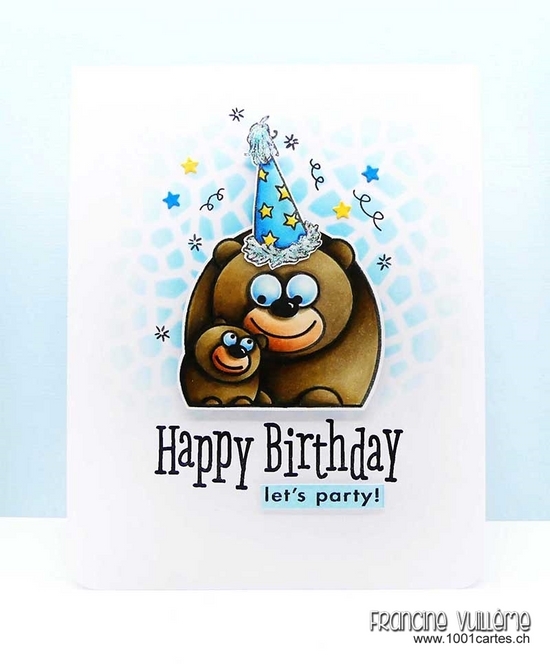 Those bears adorable on your birthday card. Thanks for sharing it with the double day blog hop! I see Hero Arts Prayers set is on your favorites list, as is on mine too. Such a fun card! Fantastic colouring. Lovely. Such a cute card and so well done! I love the background and the colouring of the bears is so well done! Such a cute card, love!! Adorable with a light touch for the stenciled background. Whaat a cute card! My grandchildren would love it!! This card is so adorable. I love the coloring of the cute bears and the little blue stencil background. LOVE this cute image. What a sweet card. The cutest bears. What an adorable card! Thanks also for posting your favorite hero arts sets. Wish some of the retired ones would come back.